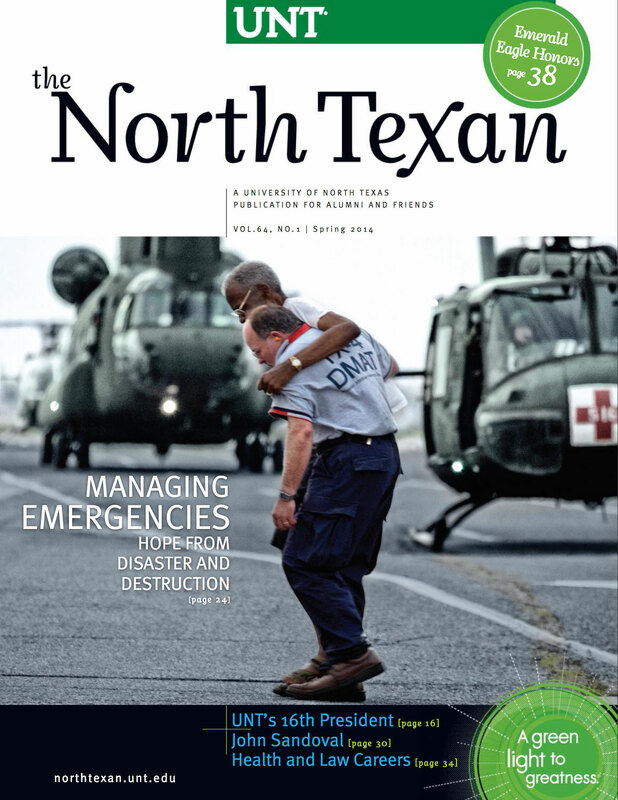 UNT alumni create promise and hope from disaster and destruction. Neal Smatresk's first day started with interview on DFW's WFAA-TV by alumna Cynthia Izaguirre. Art alum William "Bill" Worrell remembers time on campus fondly. Neal Smatresk helps UNT take its rightful place at the top. Students learn in an environment rich in opportunities as UNT advances research and creativity. Pediatric surgeon helps children fight cancer at St. Jude's Children's Research Hospital. Making UNT a first-choice institution and partner. UNT's programs and pre-professional tracks prime students for law and allied health schools. Event showcases notable alumni and benefits high-achieving but financially challenged students. Bill Schmidt, 1972 Olympic bronze medalist in the javelin carved out career in business. UNT instructor Kristin Alder appointed to serve as a United Nations representative. Students raise funds for their nonprofit, EverCare Medical Foundation. Oscar winner Olympia Dukakis mentors UNT theatre students. How can you start your own investment portfolio? UNT Alumni Association kicks off first luncheon for young professionals. UNT alumna creates art at Dallas public drinking fountain to honor civil rights activists. New UNT ArtSpace Dallas gallery now open. Mean Green football team captured a bowl championship and 38,000 fans were in the record crowd. Snarky Puppy and other alumni take home wins across categories. 1955 photo reflects former student's mentor. Alum remembers favorite places on campus. Olympian Johnny Quinn was adept on the Internet as well as the bobsled. M.P.A. alum remembers '70s computer's course. UNT alumnus heads Service King centers. Alum reflects on Heart of Dallas win. UNT alumna awarded for her wildlife CSI work. Professor of materials science and engineering named a National Academy of Inventors fellow. UNT College of Education's international student teacher exchange program marks its second year.